During the past few decades, interest in ordinary architecture has grown rapidly and in diverse directions. Scholars and field professionals apply the term "vernacular architecture" to a range of structures including traditional domestic and agricultural buildings, industrial and commercial structures, twentieth-century suburban houses, settlement patterns and cultural landscapes. The Vernacular Architecture Forum was formed in 1980 to encourage the study and preservation of these informative and valuable material resources. In both membership and methods, VAF embraces the value of multidisciplinary interaction. Historians, designers, archaeologists, folklorists, architectural historians, geographers, museum curators and historic preservationists contribute substantially to the organization. Just as wide ranging are the interests and research subjects of our members. If you are interested in learning more about vernacular architecture and in building associations with like-minded students, scholars, and professionals from all parts of the continent and the world, then you should join the Vernacular Architecture Forum today. You can learn more about the VAF as an organization by exploring these pages. We encourage the formation of regional chapters. VAF members have the opportunity to form regional chapters, and to join our e-mail discussion list. Members also benefit by receiving our well-regarded journal, Buildings & Landscapes, the VAN a quarterly e-newsletter, and discounted conference registration. Nominees must be members of the Vernacular Architecture Forum. Please include a short letter (not exceeding one page) indicating the position for which the person is being nominated and describing their qualifications as well as a short vita/resume (not exceeding two pages). Self-nominations are actively encouraged. Nominations should be sent to William D. Moore at moorewd@bu.edu, preferably before October 1, 2016. This Vernacular Architecture Forum-sponsored session invites architectural historians to explore the practical and ethical dimensions of studying vernacular architecture in a global context. How does a broader geographical field challenge and test professional practices and assumptions? Since the 1980s, scholars of the vernacular have developed sophisticated methods and theories that govern their work. From an early emphasis on agricultural landscapes, local culture, and fieldwork, to today’s digital recording and interpretation of real and virtual places, students of vernacular architecture have emphasized method and practice, especially the practice of field documentation. “Vernacular” has long been associated with a world history of architecture. Articles in Traditional Dwellings and Settlements Review and in the VAF’s Buildings & Landscapes increasingly display the widening extent of vernacular architecture studies across the globe. The Glasgow meeting presents an excellent opportunity to gather resources and think about the future of vernacular architecture studies. We invite scholars of vernacular buildings and landscapes from around the world to submit proposals that address questions such as: What are the ethics of field documentation? How should scholars of the built environment engage with communities where there is a power differential? Should we encourage Institutional Review Board (IRB) oversight? Are national borders relevant? How do we ensure that our research is systematic and comparative? How can we find evidence that challenges pre-determined claims? What do vernacular methods teach scholars of world architecture in general? We welcome comparative approaches to vernacular architecture across time and place, and encourage proposals from members of other vernacular architecture-based professional associations around the world. In addition to this panel, a VAF-sponsored conference tour will explore local Scottish vernacular architecture. 1 Abstracts must be under 300 words. 2 The title cannot exceed 65 characters, including spaces and punctuation. 3 Abstracts and titles must follow the Chicago Manual of Style. 4 Only one abstract per conference by author or co-author may be submitted. The VAF is pleased to announce a call for participation in a student roundtable to take place at the upcoming Durham Conference. Please see below for details and to get involved. What do current students of vernacular architecture have in mind? Vernacular architecture scholars are trained in a range of departments and programs, including architecture, architectural history, art history, area studies, history, geography. Thus, the annual meeting of VAF is an important opportunity for such dispersed students to meet up, exchange ideas, and forge professional networks. More than 35 years after the forum's establishment, what can current students do for VAF as future scholars/professionals in this field? In turn, how can the VAF assist in shaping students' careers and their ability to contribute to the field? This student roundtable aims at collective brainstorming about student involvement in VAF. If you are a current student and interested in answering these questions (even if you cannot physically come), please complete a short survey (http://goo.gl/forms/o9Lz0VCVzV) and add your thoughts on Google Doc (https://docs.google.com/document/d/1-mKc7vgFhDy_7CSOJlvr415RnbrnGOxfPyp4FOTYZeQ/edit?usp=sharing). For any questions, please contact Yuko Nakamura (PhD candidate in architecture, University of Wisconsin-Milwaukee) at nakamur4@uwm.edu. CFP Deadline Extended: "Field Notes"
Call for Proposals: New "Field Notes" session at VAF, Durham. Please send a 1-2 page c.v. and a short (500 words max.) proposal by February 15, 2016 to Gretchen Buggeln gretchen.buggeln@valpo.edu. Contact Gretchen with any queries. 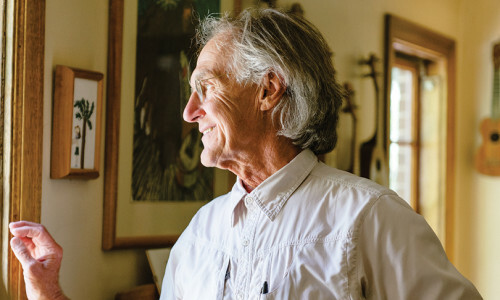 Tom Carter, former VAF president, current member, and professor emeritus at the University of Utah is featured in Continuum, The Magazine of the University of Utah. 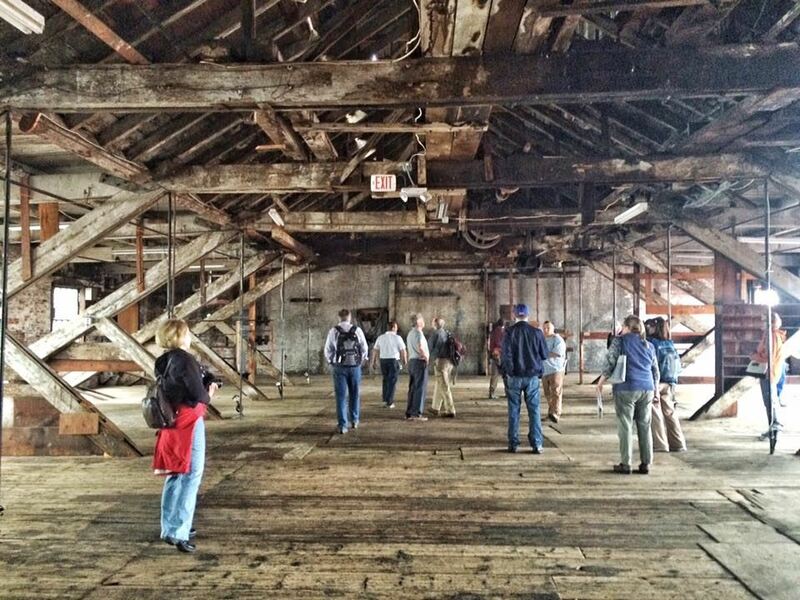 See full article here: "The Stories Buildings Tell." Member Forum: Stay in the loop and share events, opportunities, and general queries! Screenshot of Member Forum. Access it when you log in. Are you subscribed? Have you checked the VAF Member Forum lately? The VAF Member Forum is the new home of what for a long time was the VAF email list serve. 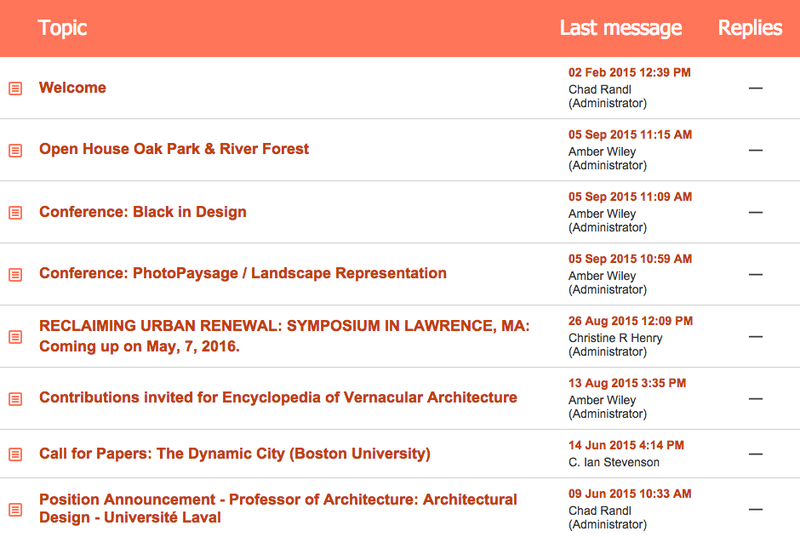 The VAF Forum allows members to share inquiries and information like the old email listserve but it also functions as an archive of all conversations. Feel free to add a new topic or respond to an existing one. You can subscribe to the Forum or to individual posts so that you receive email notification (daily, weekly, or immediately) whenever new content is posted.